alaTest has collected and analyzed 816 reviews of Samsung Galaxy Tab A 7.0 (T280, T285). The average rating for this product is 4.4/5, compared to an average rating of 4.5/5 for other products in the same category for all reviews. Reviews about the portability and performance are generally positive. The size and price also get good feedback. Many are critical about the camera. We analyzed user and expert ratings, product age and more factors. 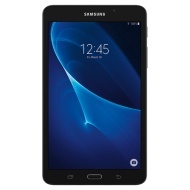 Compared to other products in the same category the Samsung Galaxy Tab A 7.0 (T280, T285) is awarded an overall alaScore™ of 91/100 = Excellent quality. Nice smooth design, good graphics. Really love this product. Use it at work to read manuals and looks up parts for our vehicles. Does amazing job. The Samsung Galaxy Tablets are a great product family. The only flaw I have ever found with them is the micro-USB port, which seems to get damaged easily. charging port can be damaged to easily. So far have noto encountered any problems..great product! I bought this tablet to replace my first generation Nexus 7. The Samsung Tab A 7" is the perfect size for my needs. The tablet has all the processing speed I need for office apps, and the screen size and resolution are great. Highly recommended!